If popular culture is to be believed, everyone hates criminal defense attorneys. They’re forever portrayed as earning hefty paychecks by finding loopholes in the legal system that allow violent criminals to walk free. So yes, innocent until proven guilty has become a scarily tenuous construct. So it’s always fun to read about the criminal defense lawyers who really believe their client is innocent, and their attempts to put the burden of proof back on the state, where it belongs. Allen Eskens writes about one of those lawyers – actually two of those lawyers – in The Heavens May Fall. The Heavens May Fall introduces us to three main characters. First we meet Max Rupert. Max is a detective whose wife was killed by a hit and run driver four years earlier. The day we enter the story is the anniversary of her death. It’s also the day he is called to the scene of a murder – a woman’s body found left in an alley. Shortly after, we find out that the body belongs to the wife of our second main character, Ben Pruitt. Ben is a criminal defense attorney and he and Max have a past – and unpleasant past. Unpleasant enough that Max has absolutely no doubt whatsoever that Ben killed his wife, despite an overwhelming lack of evidence indicating that this is so. So enters our third, and truly our main, character – Boady Sanden. Boady used to be a criminal defense lawyer, and now is a professor of law. Boady and Max are friends. Boady and Ben are friends. Boady is going to come out of retirement to defend on friend against the other and it’s not going to be pretty. The book follows the three, from the alternating points of view of Max and Boady, as the case develops. And yes – everyone hates criminal defense attorneys…until they need one. The Heavens May Fall is filled with good stuff. Author Eskens does not skimp on character development, not one bit. These people are complicated, and their relationships are complicated. For the most part they come across as believably human and fallible, so that even when they seem to be blinded by prejudice, we understand where it comes from. He lets all his characters be both good and bad but doesn’t make the mistake of leaving us with no one to root for. Boady is the good guy here, and despite his flaws, that is always clear. The story itself, of the investigation into the murder of Jennavieve Pruitt, is well plotted and pretty well paced (there are a few slow spots, particularly when Max is the focus). The narrative is just slippery enough with the shift in perspective to keep you guessing about what really happened to Jennavieve Pruitt. The end is satisfying and consistent. 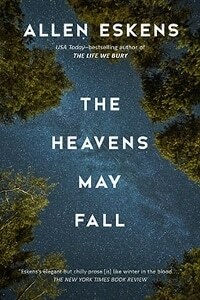 Overall, The Heavens May Fall is a good courtroom thriller with well-drawn characters and a nicely developed plot. I really don’t have any major complaints and enjoyed the read. 4 stars out of 5 and a recommendation for anyone who likes courtroom drama. Three of the characters from this book also appear in Eskens previous book – The Life We Bury – which I plan to put on library hold right now.